Telenext Systems is a young company attempting to bring a fresh lease of life into the aging telecom VAS ecosystem. We believe that there is still a tremendous amount of potential in building customized solution for the telecom ecosystem. The key here would be to build modular, versatile and targeted solutions which fit the customer business line with razor fine precision. » If you believe in the power of Collaborative Development. Build what is needed. Tap into the vast pool of Open Source for the rest and build something robust, elegant and cutting edge. » If you are a telecom operator then we are pretty sure that you wish you could leverage the existing infrastructure and provide something which is a little different from what is currently available. If you have the need then we can build something to convert the need into a solution. » You might be a Value Added Services Provider or Content Provider with your own technology competency but don't just let go of a new concept or a business lead because you do not have the required expertise or manpower, we might be able to help. The actual model of engagement can be customized to suit your need. » For Small and Medium Enterprises, connecting to your end customers has become a basic necessity of marketing and operations. We understand telecom technology well and we can help you build integration layers / multi-tiered products which can help you connect to your end customers via different telecom channels. » If you are an individual with an entrepreneurial streak and you have a world changing product concept we can help you out with technology resources, support and telecom expertise. » Building and Managing Large scale Messaging Infrastructure like SMSC, SMS Router, USSD Gateway for Telecom Operator and VASP clients. » Subscriber and Billing Management for VASP as well as billing middleware between legacy systems and telecom networks. » Analytics and Custom Intelligence reports targeted towards the telecom ecosystem. 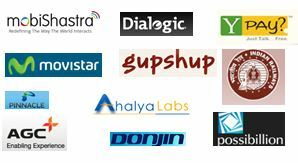 » Develop Custom Applications on SS7 MAP, INAP, ISUP, SMPP, XMPP, SIP, DIAMETER etc.